White Shock formula with Actilux®, the activeingredient that uses the power of light to whiten teeth. The toothpaste in the 75 ml maxi pack can be used alone ortogether with the BlanX LED light activator that comes in the 50 ml pack. 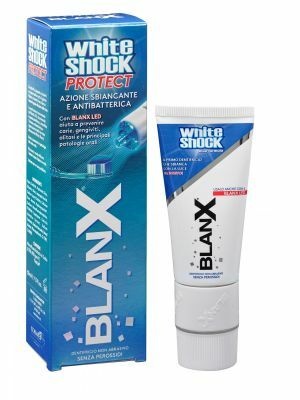 BlanX White Shock Blue Formula is the only ActiluX® based toothpaste. INGREDIENTS: Acqua, Sorbitol, Hydrated Silica, Glycerin, Silica, Isopropyl Alcohol, Sodium Lauryl Sulfate, Cellulose Gum, Aroma, Hydroxyapatite, Sodium Monofluorophosphate, PVM/MA, Copolymer, Cetraria, Islandica Extract, Sodium Saccharin, Sodium Benzoate, Benzyl Alcohol, Phenoxyethanol, CI77891, CC42090.